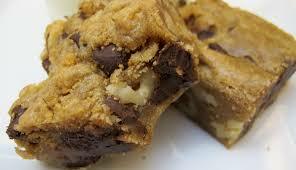 A blondie bar with Gurley’s ingredients is a rich, sweet dessert bar. It resembles the traditional chocolate brownie, but substitutes vanilla for the cocoa used in brownies, and contains a healthy dose of brown sugar. Combine the butter, sugars, salt, and vinegar, stirring to combine. If mixture is hot from the melted butter, let it cool to lukewarm. Add the eggs, vanilla, and baking powder, beating well. Stir in the flour, mixing thoroughly. Scrap into the prepared pan, using your wet fingers to smooth the top. Bake the bars for 30 minutes, until the top is golden and shiny, and the center is just barely baked through. Use the sharp tip of a knife to peek into the center; it should be very damp, but not unbaked. Remove the bars from the oven, and cool to lukewarm before cutting. You can use a 9" x 13" pan for thicker bars. Just add 8 minutes to baking time.